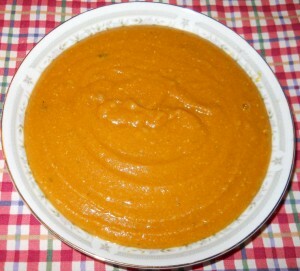 We make this deliciously spicy red lentil curry soup in our 6-1/2 quart slow cooker. It is also great for leftovers, and the soup can even be stored in the refrigerator in the removable covered cooking pot for a few days. If you want to make a smaller amount, cut the recipe in half. We usually begin the evening before we want to eat the soup, by placing 9 cups of cold water in the container of the slow cooker (set on low heat), and add the cleaned red lentils. Mix and cover the pot, and let simmer overnight. In the morning, we clean the vegetables, peel the onions and peel or scrub the carrots. They can be either diced or pureed in a high speed blender (for this recipe, we pureed the veggies in the covered blender container on high speed. Add the diced or pureed veggies and the seasoning to the container of the slow cooker and mix well, and continue simmering at low heat for a few hours until the vegetables are cooked, mixing occasionally. Add additional water if desired. Turn off the heat, add the fresh lemon juice if desired, and mix well. Where is the True Jesus Christ?